Wins/Snubs: Best Picture, Best Director (Michael Cimino), Best Supporting Actor (Christopher Walken), and Best Sound. DeNiro was beat out by another movie about the Vietnam war - Jon Voight in Coming Home, which also took original screenplay. Meryl lost to Dame Maggie Smith in California Suite, a comedy about a hotel and misadventures. Don't feel bad, Meryl won the next year for Kramer vs Kramer. This increases my Best Picture viewing again, and pushing the most recent one I haven't seen back to 1970s Patton. This one has been in my list for ages. But the controversy and "heavy" nature people ascribe to it have always scared me off a bit. The length of well over 2 hours also put me off a bit. However, now that I've seen it, I recommend that anyone who really likes to understand film, studies film, and likes to talk about film should make a point to see this. 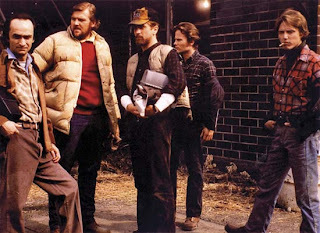 The Deer Hunter takes place in 3 acts - the first in an industrial town following a group of guys, one of whom is preparing for his wedding, just before they all ship out to enlist for the war in Vietnam. Act 2 takes place in Vietnam, watching the torture, escape, and attempts to get home they have to go through (particularly DeNiro's Mike, Walken's Nick, and John Savage's Steven). The final act looks at how they each deal with what happened - Mike comes back and is able to get together with Nick's girl, Linda (Streep). Steven came back without his legs and is having trouble dealing with any life outside the military hospital. Nick never returned due to really horrific circumstances - and eventually Mike honors a promise to not leave him over there and goes to find out what happened. The movie is really powerful. It received a lot of criticism for demonizing the North Vietnamese and in particular their use of Russian roulette (putting one bullet in a gun, and then daring to pull the trigger with the gun to your head). To me it felt more like that was a metaphor more than a true to life torture method they actually used - given that a certain percentage die, doesn't seem like an effective or efficient torture method. It's more taking away the idea that any prisoner has a chance to survive the war - they're all equally likely to die. Also, the particularly gruesome picture of war (only 5 years after the War ended) would have been extremely jarring and controversial at the time - today we've seen more, but you can see where the inspiration came from for onscreen depictions of war. DeNiro's quiet, angry performance is really amazing. He's improved on his Godfather performance even with the strength and rage he exudes. He's fiercely loyal to his friends, but doesn't put up with their issues. The other part of the film that is amazing is Christopher Walken's performance - he's young and hasn't taken on many of the ridiculous idiosyncrasies he's known for now. He's a broken man - you have to see what a happy man he begins with to understand how broken he becomes by the end of the film. It's broken without destruction - he's very much physically in tact, but his mind is just gone dealing with his past actions, and his perception of those actions. I really like the last act in the film, but the oft praised Vietnam stuff never does much for me. I also could do with less dancing on the front end of the film. Honestly, I think Cimino's followup, Heaven's Gate, is a much better film and not nearly as terrible as the history books make it out to be.